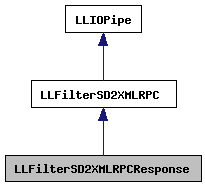 Filter from serialized LLSD to an XMLRPC response. This class filters a serialized LLSD object to an xmlrpc repsonse. Since resonses are limited to a single param, the xmlrprc response only serializes it as one object. This class correctly handles normal llsd responses as well as llsd rpc faults. Definition at line 90 of file llfiltersd2xmlrpc.h. Definition at line 307 of file llfiltersd2xmlrpc.cpp. Definition at line 311 of file llfiltersd2xmlrpc.cpp. Definition at line 317 of file llfiltersd2xmlrpc.cpp. References DEFAULT_PRECISION, LLSDSerialize::fromNotation(), llendl, llwarns, PUMP_DEBUG, tut::sd(), LLIOPipe::STATUS_BREAK, LLIOPipe::STATUS_DONE, LLIOPipe::STATUS_ERROR, LLFilterSD2XMLRPC::streamOut(), xml_escape_string(), XML_HEADER, XMLRPC_FAULT_1, XMLRPC_FAULT_2, XMLRPC_FAULT_3, XMLRPC_METHOD_RESPONSE_FOOTER, XMLRPC_METHOD_RESPONSE_HEADER, XMLRPC_RESPONSE_FOOTER, and XMLRPC_RESPONSE_HEADER.